Apparently five submissions are currently being considered for buildings on the Munro site. One of our traders (thanks Jacob) has suggested that an accomodation hotel would be a great component for the building. Imagine a major city hotel on our doorstep? It would make so much sense for tourism and would be like having a cruise ship visiting our market every day. Being adjacent to our low height market would give uninterrupted hotel views and the market food and cafe facilities would be great companions for an accommodation facility. Memo to Renewal Program Director, Joanne Wandel: Can we please have a hotel at Munro's? Rumour has it that a new organisation is being set up to represent traders at QVM and we thought it might be a good time to look at the performance of the primary facility for trader/management engagement - the QVMAC. 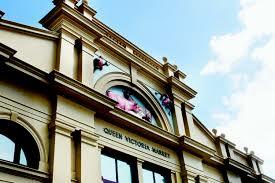 The Queen Victoria Market Advisory Committee has evolved from the old Trader Advisory Committee that had two Trader Representatives and discussed daily operational matters like cleaning and maintenance. "Things have come a long way." 1. Requesting David O’Neil’s attendance and advice on market development. 2. Lighting improvements across the market. 3. Single day absences for SL Traders. 4. Showcase marquee on Therry St.
5. Advice and input on a whole range of documents including Trader Induction Manual, Strategic Brief on QVM Renewal, Renewal Master Plan, Huddle Report, etc. 6. Representing traders at a recent National Markets Conference. QVM is trading in difficult times. A list of achievements can never be long enough, but the QVMAC has certainly made a contribution. 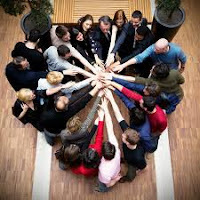 Its role of “co-operative involvement” with management has received criticism from some quarters and praise from others. There are some traders who wish to protect what they already have and resist any change. For many others getting involved in change is a good thing and an inevitable component of renewal. They believe that active participation gives traders the best chance of influencing outcomes. Can a new organisation offer something more? This will obviously depend on the organisation and its operators. Will this organisation resist change or embrace it? Will it take a world view of our market or will it just look to protect certain trader interests? Will it provide professional commitment to market matters or just focus on its own limited agenda. Will it be truly dedicated to performance or just long on promises and short on action? This is an interesting new development as QVM looks intently at the whole question of Trader Governance. We wish the new organisation well. Any organisation that wants to make QVM a better market is welcome. Let’s see how this one stacks up. Thanks for your input Alby - Ed. Thanks for your views Ivano - Ed. Last year the State Government and City of Melbourne announced that they would be seeking World heritage approval by UNESCO for the Queen Victoria Market. Part of the reason for that approval would be to guarantee heritage protection for the market. 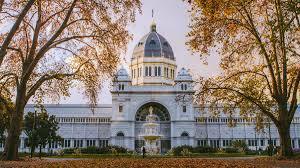 That approval could take many years but according to today's Age, Lord Mayor Robert Doyle, has revealed the possibility of linking QVM with the existing World heritage Listing for the Exhibition Buildings and Carlton Gardens. Apparently the clear social and economic links between the two sites could extend the cover to both. That could be a very positive move for our market. We are reluctant to pick out individual traders but we recently posted an article about stall spreading and we just had to show this photo as an example of a spread that has gone bad. This traders sparse presentation complete with tatty cardboard boxes does him and his business no favours at all. 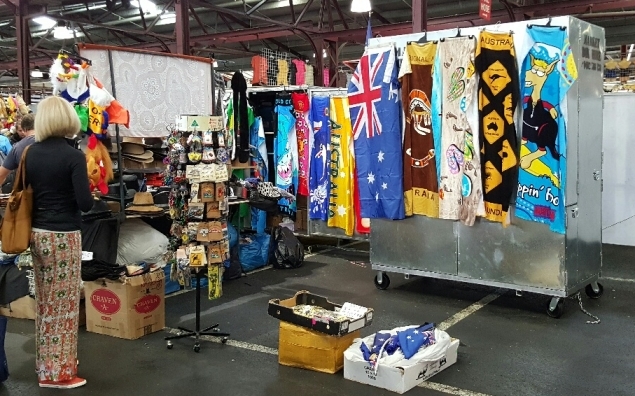 As one trader said, "the stall would have looked better completely empty". Our advice? Firstly, get approval to spread, and secondly, make sure you have enough stock and quality fittings to make it look good. The Herald Sun has published an article online about trader attitudes following a poll they conducted in the market last week. More than 30 of the 50 traders said they were satisfied with the current state of the market although, when it came to the QVM Master Plan, two-thirds were either dissatisfied with the plan or knew little about it according to the Herald Sun. 08/02/2016 08:50:48 Market Future. "You are saying 60 percent of traders are happy with the way the market is. No way! The market is dying. Half of the sheds are empty and and half of whats left are loosing money under this conditions. The grand opening of Creswick Woollen Mills new shop at 145 Therry St. (Queen St. end) took place with a bit of theatre on Thursday as Alpacas paraded on the footpath in front of the shop. 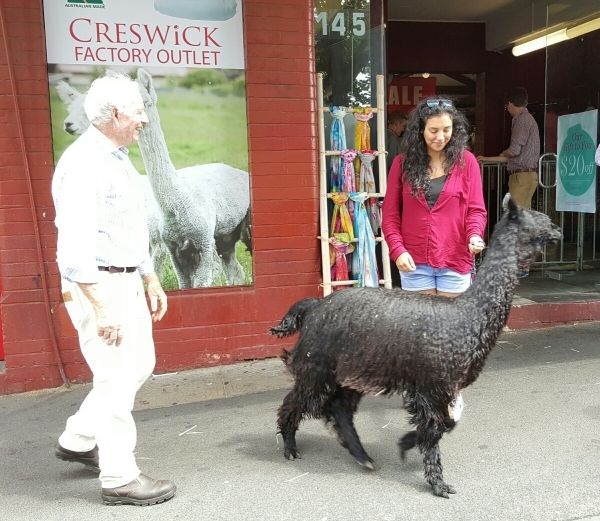 The interior of the ex antique store has been transformed into a perfect setting for Creswick's range of quality natural fibre products. Passing tourists were delighted by the occasion. Heat can be an issue under our sheds and there are a number of aspects that need to be considered but one issue that has been tackled is the impact of extreme heat on our older traders. QVMAC Trader Representative, Ivano, presented the following paper to yesterday's QVMAC meeting on behalf of Trader Representatives. Due to trading conditions under the Sheds during days of extreme heat, attention needs to be given to the welfare of traders, this matter becomes urgent when considering older traders who are in a particularly high risk category. We have a very limited number of older traders at the Market (see below), some with pre-existing health conditions, which places them at even greater risk. Research from various recognised sources indicates that people aged 65 years and over are at a higher risk of being adversely impacted on days of extreme heat. discussion, but some data sets the at risk temperature as anything from 30° up. All traders 65 and over be exempted from being required to attend the Market on days where the temperature is forecast to be 36° or over. the recommendation is that this provision remains outside the current leave provision extended to traders. An onsite evaluation conducted on Sunday 24th of January 2016 determined that 14 traders fall into the 65 years or over category. Heatwaves kill more Australians than any other natural disasters. They have received far less public attention than cyclone, flood or bushfire – they are private, silent deaths which only hit the media when morgues reach capacity or infrastructure fails. There has never been a national study which uses a common definition of heatwaves and directly comparable mortality data. Australia has no national heatwave plan. This report remedies these deficiencies and recommends strategies for the national, state and local governments as well as for citizens. Heat events do not affect all individuals equally. Different groups within our communities are more at risk of adverse health affects due to prolonged exposure to high temperatures than others. Risk factors include living alone, chronic medical problems and certain drugs. Take steps to prevent heat stress on days when the temperature is predicted to rise above 30°C or so. The author of this recommendation is providing only preliminary advice in line with his role as a member of the Queen Victoria Market Advisory Committee to attempt to begin to safeguard the health and interests of at risk traders in the market. He accepts no personal liability for the recommendations provided above. It remains the responsibility of QVM Market management and Market owners to carry out further studies and evaluations to establish appropriate safety requirements and measures that require implementation. At this week’s QVMAC Meeting a number of sub-committees were proposed to deal with important issues around our market. Trader input is vital to successful consideration of many issues. Traders who have particular interest in the following matters or who would simply like to get involved in trader/management discussions are invited to take part. Trader Assessment Criteria Sub-committee – this committee will examine the way traders are assessed for stall allocations, new stalls, stall renewals etc. The old system based purely on years of service is under scrutiny and a new format is being proposed that will examine a wider range of trader standards and stall presentation. What do you think of these criteria? Should others be added? What importance would you give each factor and should they be weighted? QVMAC Trader Representatives Ivano, Jenny Pyke, Stephen McLennan and management representative Brendan Devine are involved in this sub-committee. 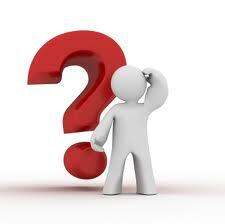 Talk to one of the Trader representatives involved or email info@qvm.com.au if you would like to be involved. Trading Ideas – Marketing Workshop - this sub-committee will be looking at ways to spend QVM’s marketing budget. The 2016/17 budget is being compiled right now so the time is ripe for trader input. Would you like to see live kangaroos bounding up Queen Street, perhaps an electronic billboard promotion like the market did with its re-branding, or a special promotion for your particular product category? This is your opportunity to get creative and we can assure you that all ideas will receive a good hearing. A meeting is being held next Tuesday, 2nd February, from 3:30 pm at the Engagement Hub, 452 Queen St. Participation in each of these sub-committees is very flexible. You may want to simply come along to the first meeting (or at any stage of the meetings) to find out what it is all about before committing yourself. The meetings will generally be held at 3:30 pm after the market on a Tuesday or Thursday. 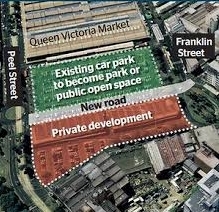 As you will see from our heading, yesterday’s Queen Victoria Market Advisory Committee meeting covered a broad range of issues which we will attempt to summarise here. The meeting was attended by members of QVM Management and all Trader Representatives except Ben Vitalone. Apologies were received from Matt Ryan and Board Members, Paul Sheahan and Jane Fenton. 1.Joanne Wandel – Renewal Program Director was introduced to the group and she gave us a brief rundown on the following matters. Munro’s Construction on Therry St. – submissions for the building to be constructed on the Munro site have been received from some high profile developers including CBUS the superannuation giant. Submissions are being worked through at present with a number of advisers contributing to the assessment. Final bids are expected to be in by the end of April with a decision hoped for mid-year. Renewal Implementation Plan – the project team is preparing for the immense task of construction sequencing and timing. Joanne hopes to have some initial thoughts ready by April/May although contact from traders is welcome at anytime. 2. New CEO Appointment Update – a shortlist for the role of QVM CEO is expected by the end of January with interviews during February and hopefully an announcement by the end of March. 3. Proposed 2016 Trading Calendar – The changing Christmas calendar brings with it decisions on when traders will trade. In 2016 (Christmas falls on a Sunday) do we trade on the Wednesday before Christmas? The Tuesday after Christmas is a public holiday but do we trade? What about Grand Final Friday 2016 and Australia Day 2017 which falls on a Thursday? It was agreed that all relevant dates would be advertised in the next Trader’s Bulletin with an invitation for traders to express their views. 4. Green Cabs – this is a new concept of bicycle power taxis. QVM has given approval for the market to be placed on the Green Cabs stopover options and the market will be supporting advertising on some of the cabs. Traders are asked to monitor the impact of the Chinese New Year celebrations and the effect on their businesses. This feedback will be used for future decisions on how resources are allocated to this type of event. It was noted that QVM have asked the City of Melbourne to change to name of the event next year to Lunar New Year so as to embrace the wider Asian community. 6. Melbourne BBQ Festival - QVM’s involvement will commence Saturday night as contestants set up their BBQ facilities prior to a Sunday cook-off. The feature event will take place at Flemington Racecourse the following weekend. 7. Trading Ideas – Marketing Workshop. QVM are keen to engage traders in a Tuesday afternoon workshop with next Tuesday’s theme being creative marketing ideas for the 2016/17 business year. See separate article. 8. Recent Power Supply Issues – this item came from a power outage in the food halls leading up to Christmas. It would seem that power source was the major problem with ongoing discussions with City Power and new sub-station design in the mix. The market is also examining the purchase of emergency power generation. The summation from management is that much work is being done to prevent a recurrence but it is difficult to give guarantees. 9. Market Security Measures – this issue related to a break in at an external cool room on Christmas Day when apparently security cameras were not working. 10. Extended Leave Letter – management have agreed to review the wording on official letters relating to traders returning after extended leave and the status of their stall holdings. 11. Directional Signage – this item was for mention with consideration currently being given to the use of static signs and the possibility of digital signage. 12. Christmas 2015 – Draft Review – Trader Representatives were asked for feedback on the impact of Christmas promotions. It was generally agreed that Christmas had presented robust trading conditions and it was felt that lead up events like the market re-branding could have been influential. The observation was made that there are many factors impacting on sales including daily weather patterns. It was suggested that at Christmas time in particular the lead page on the QVM website should focus on trading hours as a customer convenience measure. 13. Trader Assessment Criteria – The last meeting of this sub-committee was presented with a possible format which took in a wide range of factors for assessing trader performance. This is an important issue and it was agreed that we would seek additional traders to participate in the sub-committee evaluation. See separate article. 14. Enforcement of Rules (Set-up and Pack-down) – instances of late set-up and early pack-down have drawn criticism from traders as their businesses are impacted by inconsiderate acts of a minority. It was noted that current rules expect traders to be in position for stall set-up by 8:00am and completed by 9:00am with aisles clear of storage boxes. Official closing times are known to all. Traders were seeking enforcement of these requirements by market officers with a process of communication with offenders followed by more direct action if necessary. To be reviewed at our next meeting. 15. Stall Spreading – given the changing nature of vacant stalls it was agreed that this process required a complete re-look. It was agreed that a sub-committee would be set up to examine better ways of administering stall spreading including ease of administration for traders and management staff, capacity of traders to achieve a professional looking spread, and the possibility of other forms of gap-filling to maintain a cohesive look to our market. See separate article on sub-committees. 16. Extreme Heat Policy – Trader representatives have submitted a case for additional leave for traders 65 years of age and over on days forecast to exceed 36 degrees C. Traders in that age group are considered at risk by various health and statutory organisations and representatives believe they should not be penalised when adopting good health practice. See separate article. Other Matters – Trader Sales Feedback – it was agreed that a method of confidentially reporting sales data for a core group of traders would be of immense assistance in evaluating market performance and the impact of special promotions and events at the market. 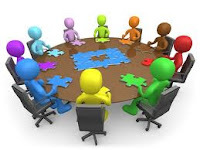 Next Meeting – the next QVMAC meeting is scheduled for Thursday 25th February 2016. Following is the agenda for today's (Thursday 28th January 2016) meeting of the Queen Victoria Market Advisory Committee. We would like to have given traders more of heads-up on what is to be discussed although the final agenda was only received yesterday. Some of the trader issues have been progressed and/or highlighted on these pages over recent weeks. We will be aiming for at least a weeks notice in future. This will be particularly important as these meetings go from bi-monthly to monthly, and we ramp up discussions over renewal. On that subject we note that we get to formally meet Joanne Wandel, the new Renewal Program Director at today's meeting. Expect a summary of the discussions in the next few days on Victraders.com. 3.30pm (prompt start) – 5.00pm finish. Do You Get More Australian Than QVM? Gloves Off......Where Is That Trader? Victoria Market Pharmacy Discounts Scripts. Boom, Bust or BAN In 2016?